A picture or two would be nice. Would love to see all of your hard work. How did you get the ratline and shrouds so uniform? was that done with a 3-d printer? I'm going to hazard a guess that those are the pre-formed vinyl ratlines and cast styrene "rigged" deadeyes that were included with the kit. Many builders replace those parts with hand-rigged wooden deadeyes and build the ratlines from waxed linen thread but the kit parts are quite usable with careful finishing and, as seen here, can yield a very attractive and wonderfully symetrical display. That's a very nice build, Bruce. You get a lot of credit for finishing, it's got to be the Great Unbuilt Kit. I'd make a couple of constructive comments, for whatever it's worth. The yards are conspicuously missing their lifts. The studding sail booms are usually attached with a really simple arrangement of a couple of iron rings. You might consider staining those lashings you added with black. Congratulations on a very nice model. Thank you for the compliment. I'm not a "purest" modeler. That means accuracy isn't my goal. I did all the rigging freelance. In fact I rarely followed any of the build instructions. I'm happy with it and found the challenge gratifying and rewarding. Off to my next build. 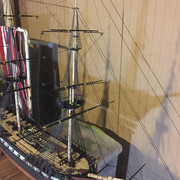 Maybe the Revell Cutty Sark, Heller HMS Victory or Revell Pirate Ship.Love to get my hands on the USS Kearsarge or CSS Alabama Revell models 1:96 scale but VERY pricey. Looks marvelous. Throwback to my original build back in 1980. Thanks for the pics. Beautiful build! Built that model when I was 16 with my then current skills. If I recall correctly all I painted was the copper on the lower hull and the white gun ports stripe. Spent several months on the rigging alone. Very,very nice build Bruce . 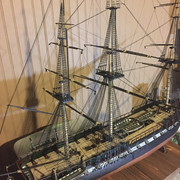 I am 88 & still building rigged ship models. I do use the Airfix or Heller rigging tool & pretty well have it figured out. I have made most all my shrouds & ratlines on it & they look good too. Yours look great & what is important is you finished it & and a nice clean build too. Lets see the Kearsarge as it is the best looking of the Alabama & Kearsarge. I did both last year.